This is one of my favorite dishes since my childhood in Czech Republic and it is a regional specialty. 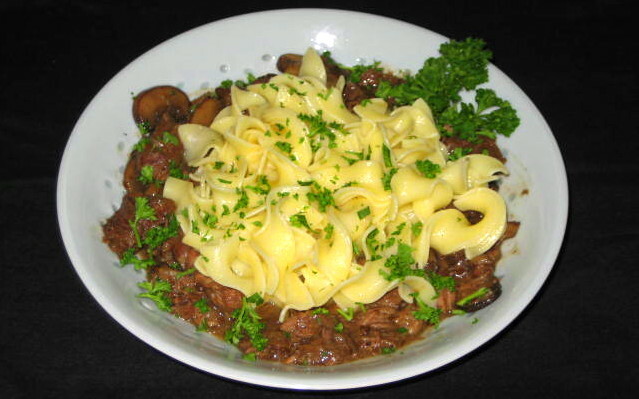 Just like so many ragouts and stews it is better next day after all flavors have combined. This is my slow cooking, no-worry version. Sprinkle the veal with salt and pepper. Melt butter in dutch oven over medium heat and when the foam subsides, add onions and cook until translucent, 6 – 8 minutes. Stir in the veal cubes till meat changes color, sprinkle with caraway seeds and flour and stir to coat meat evenly. Cover tightly and cook over very low heat for 10 minutes, shaking the pan now and then to prevent sticking. Stir in stock, add mushrooms and stir till well mixed. Bring to simmer and place on middle rack in preheated oven and braise for 2 hours. This allows for the collagen of the connective tissues to melt into gelatin, while keeping the drying up of the muscle fibers at a minimum. After 2 hours raise temperature to 275°C for another hour. After 3 hours in the oven start checking for doneness (sharp tip of a knife should go in without resistance). At this time you can start boiling water for noodles. 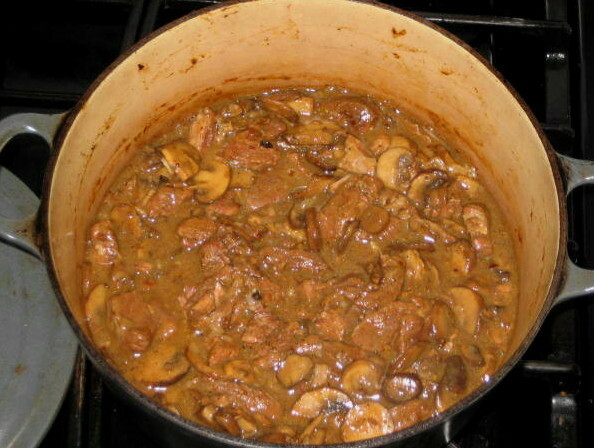 When meat is done, remove from oven and let rest so that meat will reabsorb some of the juices. Boil noodles, drain, toss in butter and keep warm. 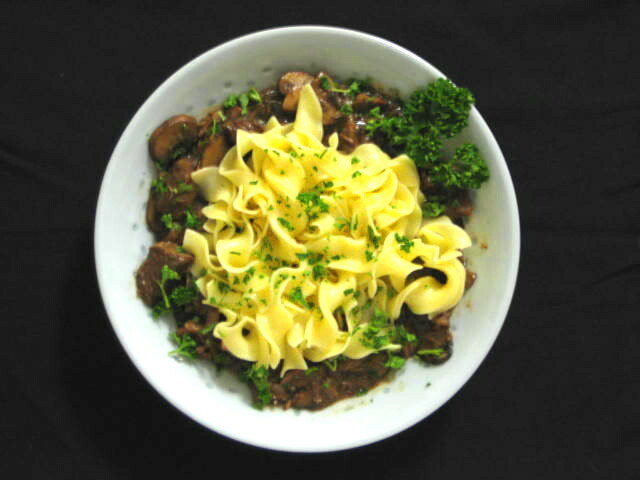 Of course, this ragout can be cooked on a stove top at very low heat but it will have to be stirred every 15 – 20 minutes for 3 hours. 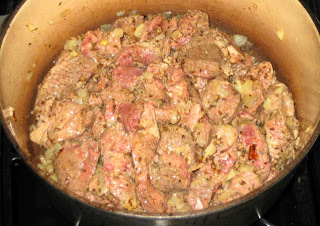 Stir in the veal cubes till meat changes color, sprinkle with caraway seeds and flour and stir to coat meat evenly. 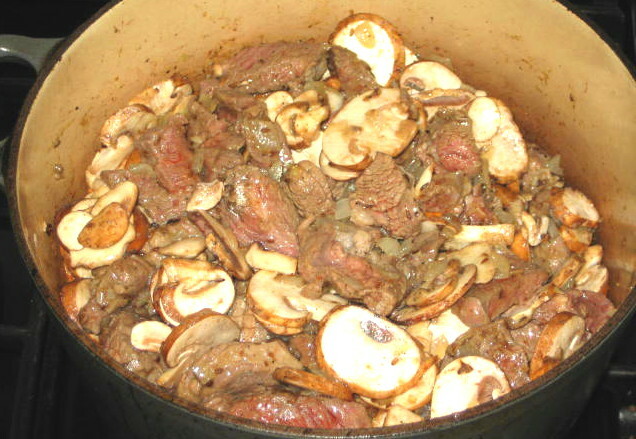 Stir in stock, add mushrooms and stir till well mixed. ﻿﻿﻿ Note: It is very difficult to photograph and plate stew, any stew. It is not a pretty meal regardless of how great it tastes. I did my best with my $150 Canon point-and-shoot camera. Also, for garnish I used parsley from my garden. I am sad to say that they were the last leaves left. I still have plenty of arugula but no parsley.